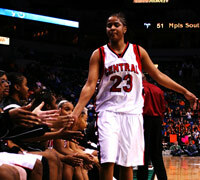 St. Paul Central Forward Ebony Black is bound for Texas. Black will attend Trinity Valley Junior College in Athens. The 6-foot "Difference Maker” is one of the best girl basketball players ever to come out of Minnesota. In her first year at Central, the senior volunteered to come off the bench. As a junior at St. Paul Johnson, Black averaged 19-points and 10 rebounds. I believe that’s called a double-double. The girl’s got game! 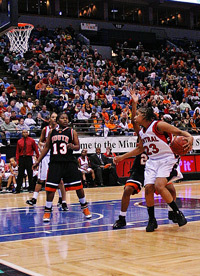 Black has scored over 2000 points and snatched more than 1000 rebounds in her career. She is 48th in scoring in the history of the state and #57 in rebounds, of all time. In March, Black racked up 18 points to help top ranked St. Paul Central beat Minneapolis South 81 to 63 in the state 4A championship game. Central finished the season with a perfect 32-0 record. Black can dominate a game with look-away passes. The "Dime Dropper" can also take players off the dribble at will, rebound in traffic, handle the ball like a point guard or post you up in the paint. In the clutch, Black can also shoot the 3-pointer from downtown with accuracy. Black brings court swagger and mental toughness to the table, which is important for the overall confidence of the team. No doubt, Trinity Junior College is getting a Division One player. Congratulations to Black for choosing a junior college--- so she can improve her academics while she elevates her game to the next level. This is a great opportunity. 0f all the players I've seen this year, Black does things on the court that'll make you stand up, smile, look around and ask strangers… "Did you see that?" Look for the "Difference Maker" to make a difference in the WNBA in 4 years.